In this section you'll find images of some of the smaller rocky bodies of our solar system known as minor planets. There are countless asteroids within our solar system of all varying shapes and sizes. Many of them are faint and remote. Below you'll find images of various such objects obtained some by accident while others deliberately targeted. 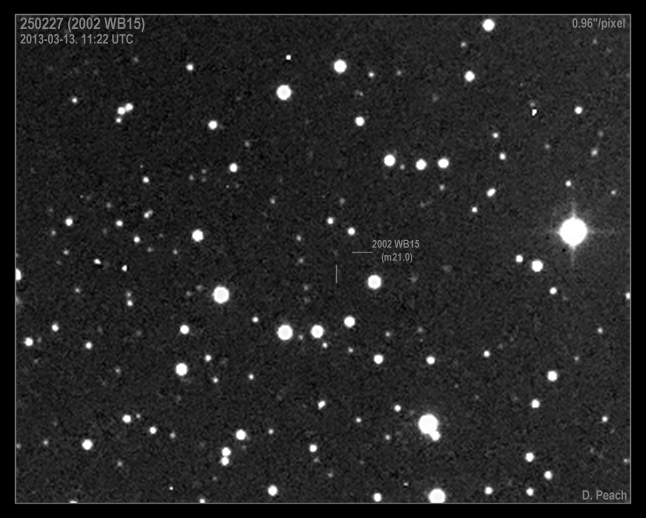 Asteroid 2011 UW158 close approach 17" CDK. FLI-PL6303E camera. 8 x 120 secs. July 19th, 2015. Seen here passing just 2.4 million km from Earth (about six times the distance to the Moon.) It spans around 0.4 x 1 km shaped rather like a walnut and spinning rapidly - once every 37 minutes. It will not pass this close again until 2108. According to different estimates, Geologists think this asteroid might contain ore of precious metals and other minerals worth from $300 billion, to an incredible $5.4 trillion. Seen here as a series of streaks during the 120 second exposures combined to make this image. 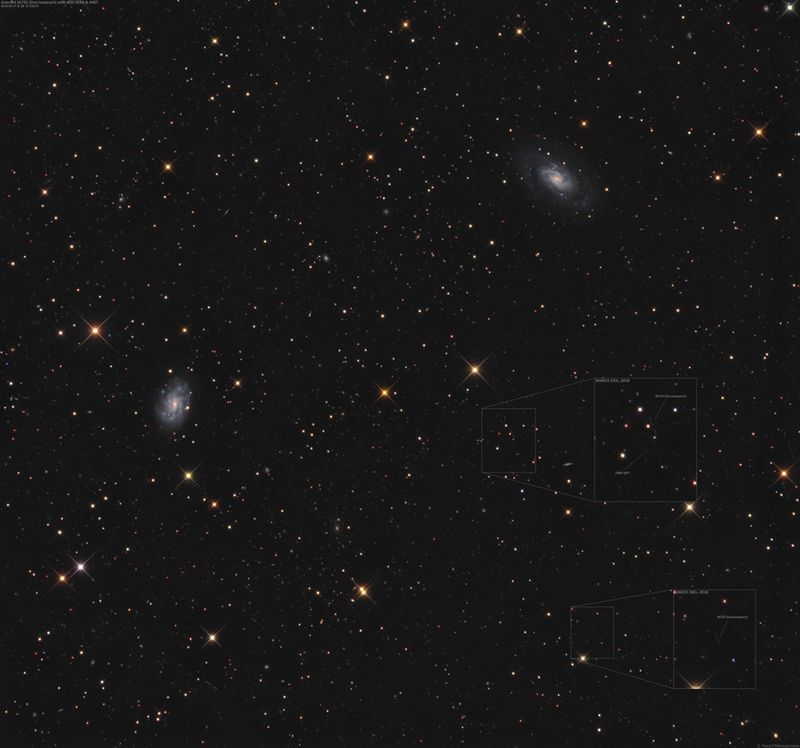 Its rapid motion across the sky is very apparent. 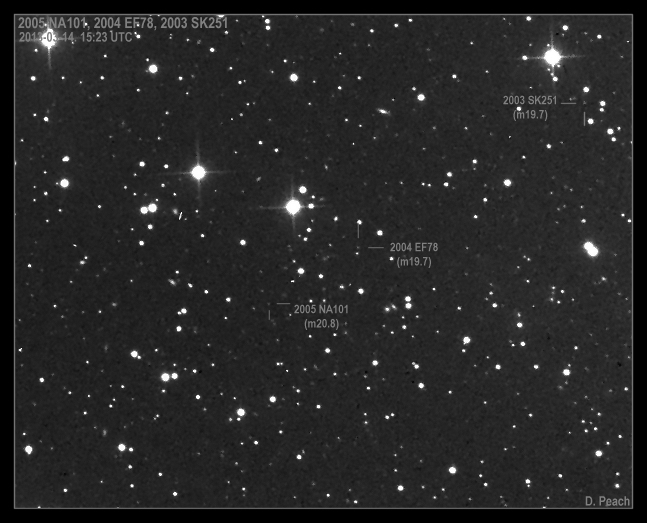 Near Earth Asteroid 1998 QE2 17" CDK. FLI-PL6303E camera. 3 x 120 secs. May 31st, 2013. 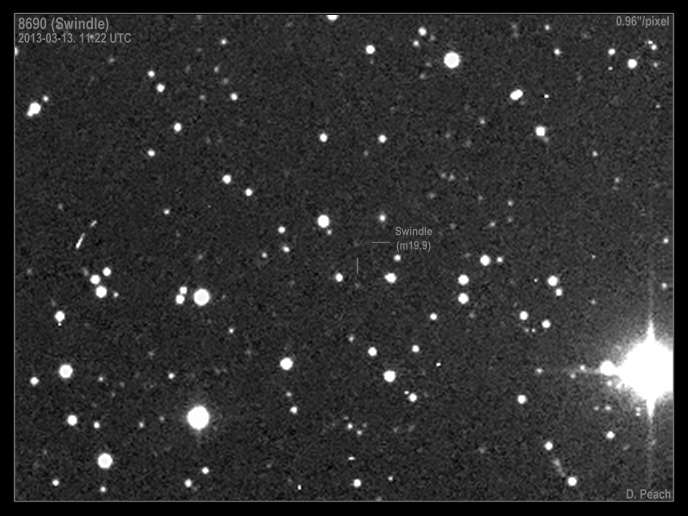 This bright asteroid passed fairly close to the Earth in May-June 2013. 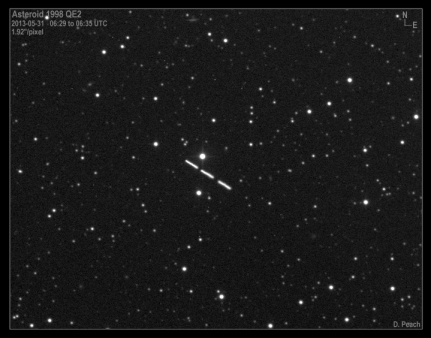 In the above image taken within a day of close approach finds the asteroid 3.6 million miles from Earth and shining brightly at magnitude 10.9 making it easily visible in small telescopes. 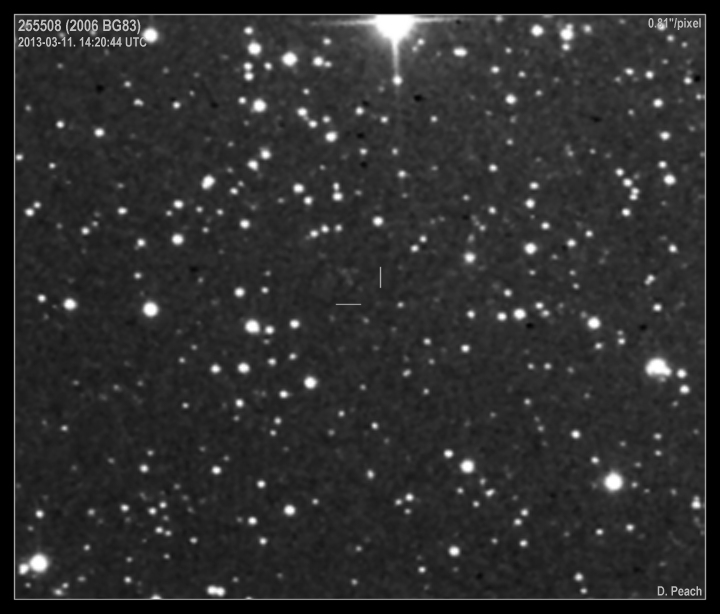 Near Earth Object 2012 DA14. 17" Planewave CDK. SBIG STL-11000 camera. 6 x 30 secs. February 15th, 2013. This 30 metre wide lump of rock set a record as the closest ever pass of an object of this size to the Earth when on February 15th it passed within just 17,200 miles of Earth's surface. 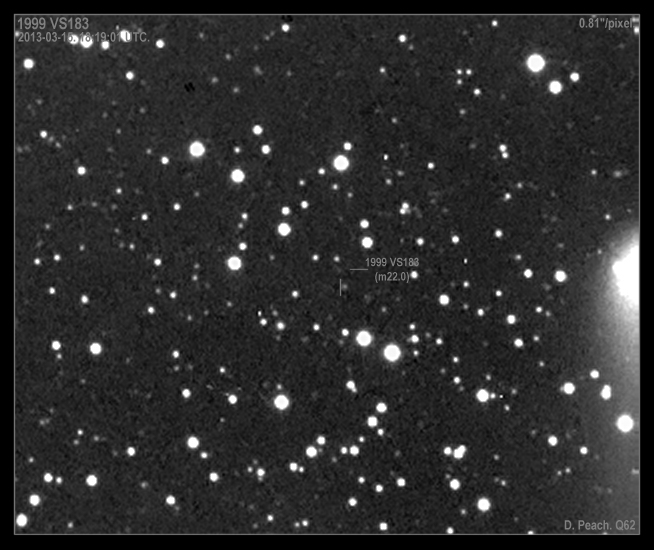 The above image captured on the night of closest approach shows the asteroid speeding through the field of view. Each streak represents a single 30sec exposure revealing the asteroids rapid motion across the sky. 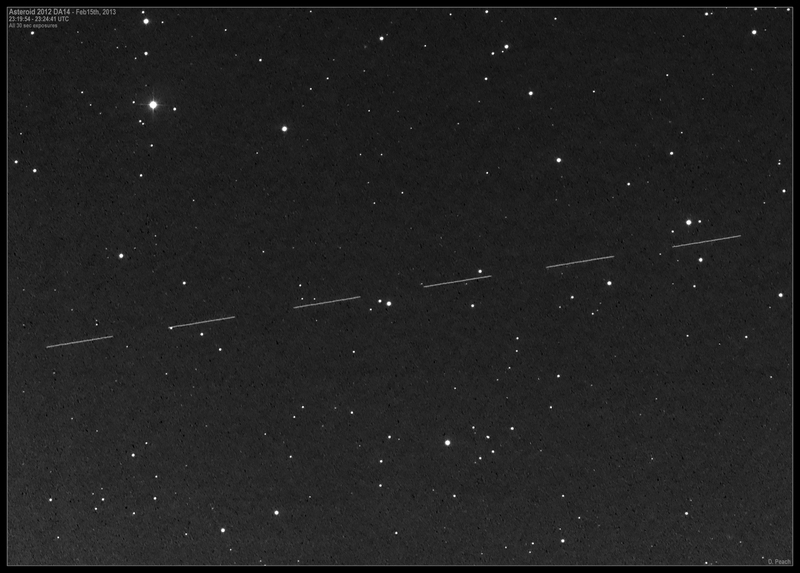 Asteroids 7239 (Mobberley) and 200 YU51 20" CDK@F4.5. 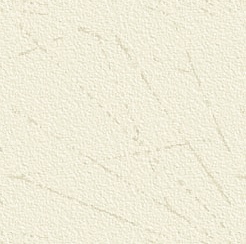 FLI-PL6303E camera. 4x3mins. March 14th, 2013. 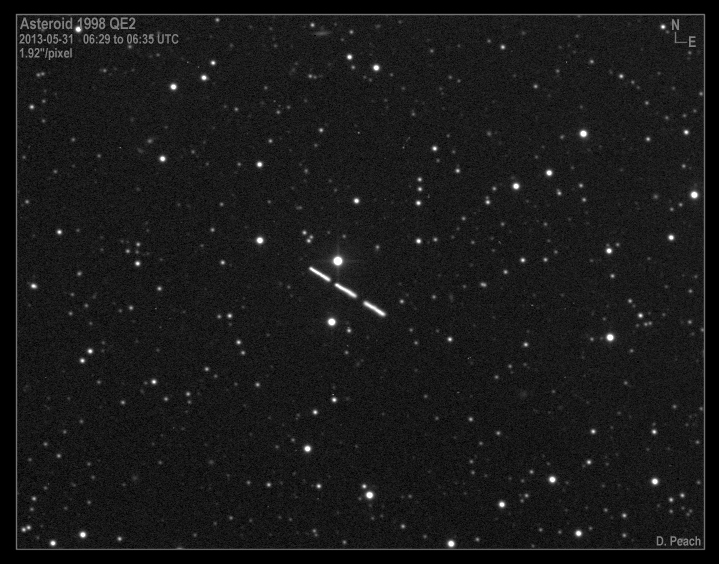 Asteroid 8690 (Swindle) 20" CDK@F4.5. FLI-PL6303E camera. 4x3mins. March 13th, 2013. 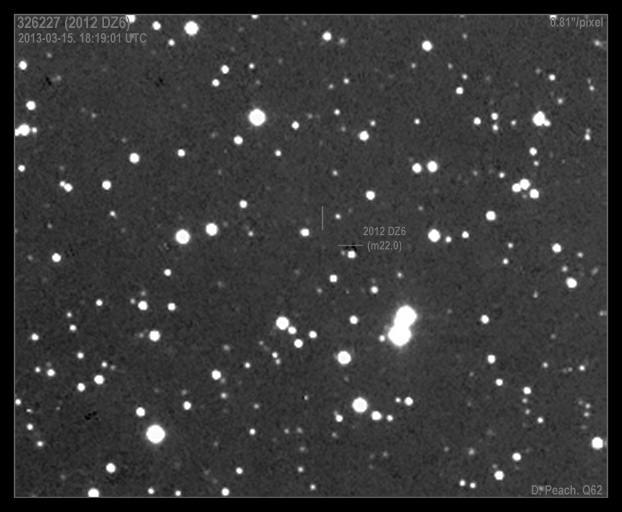 Asteroid 2012 DZ6 20" CDK@F4.5. FLI-PL6303E camera. 4x3mins. March 15th, 2013. 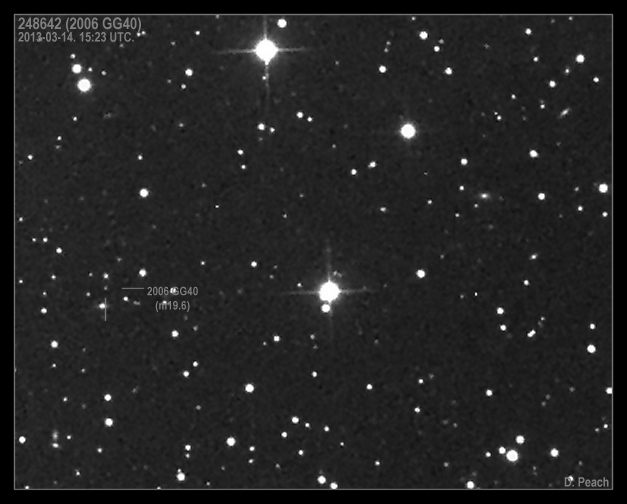 Asteroid 2006 GG40 20" CDK@F4.5. FLI-PL6303E camera. 4x3mins. March 14th, 2013. 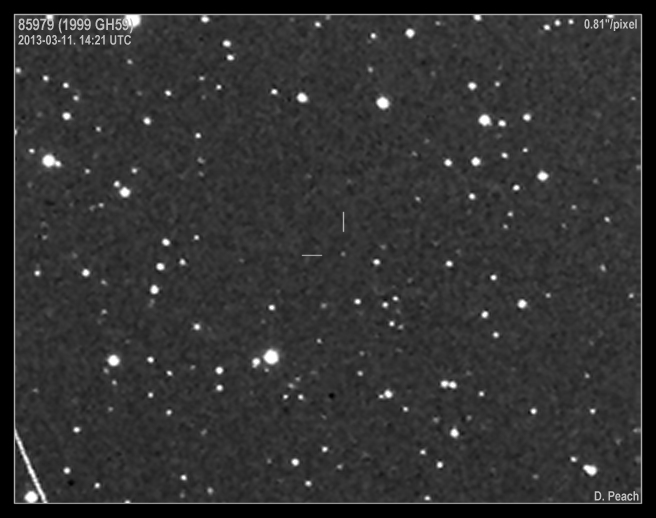 Asteroid 2006 BG83 20" CDK@F4.5. FLI-PL6303E camera. 4x3mins. March 11th, 2013. 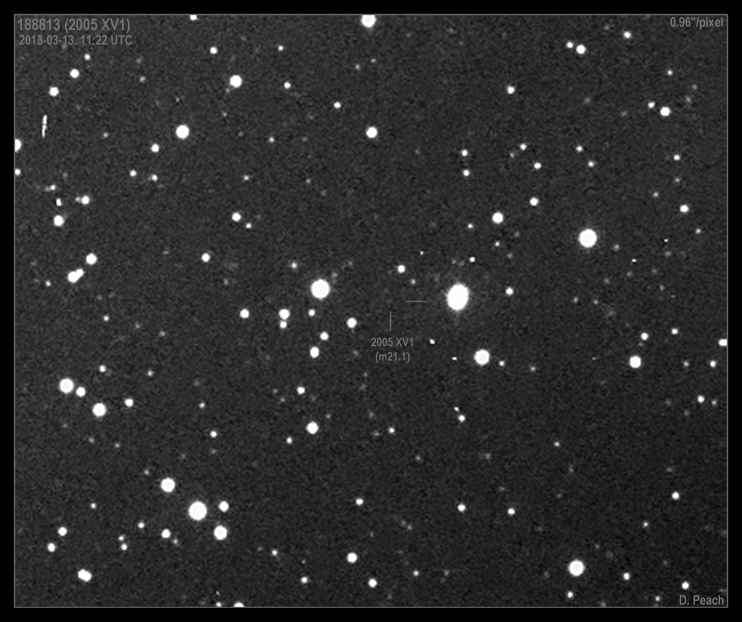 Asteroid 2005 XV1 20" CDK@F4.5. FLI-PL6303E camera. 4x3mins. March 13th, 2013. 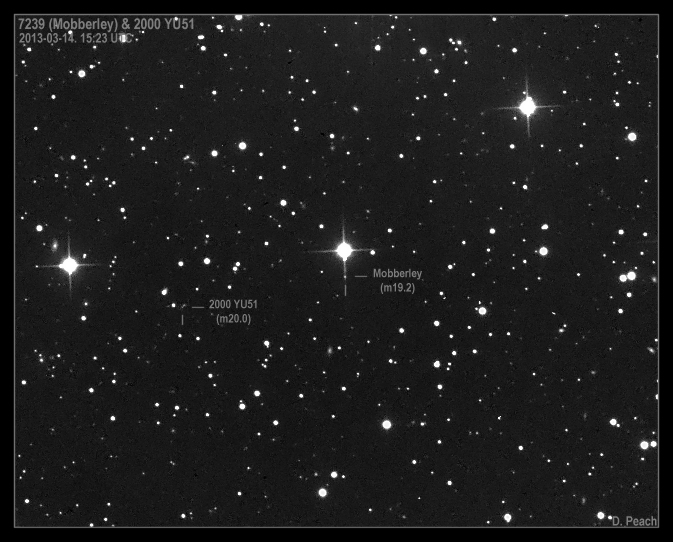 Asteroids 2005 NA101, 2004 EF78 and 2003 SK251 20" CDK@F4.5. FLI-PL6303E camera. 4x3mins. March 14th, 2013. 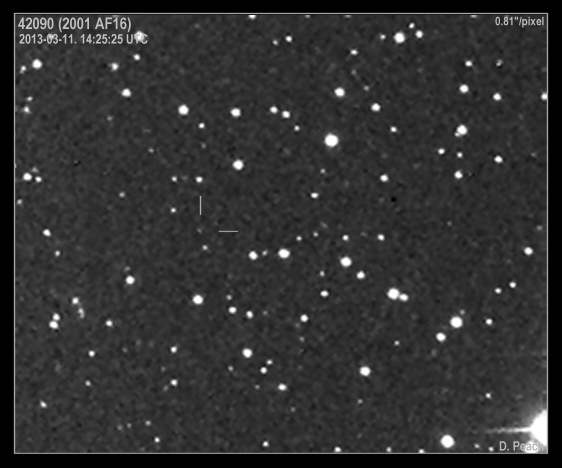 Asteroid 2004 WJ3 20" CDK@F4.5. FLI-PL6303E camera. 4x3mins. March 15th, 2013. 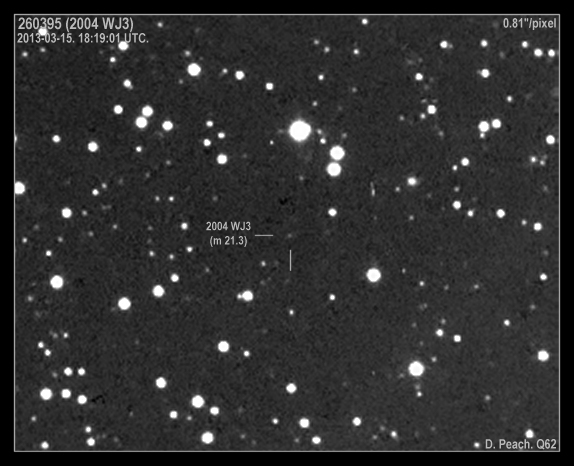 Asteroid 2002 WB15 20" CDK@F4.5. FLI-PL6303E camera. 4x3mins. March 13th, 2013. 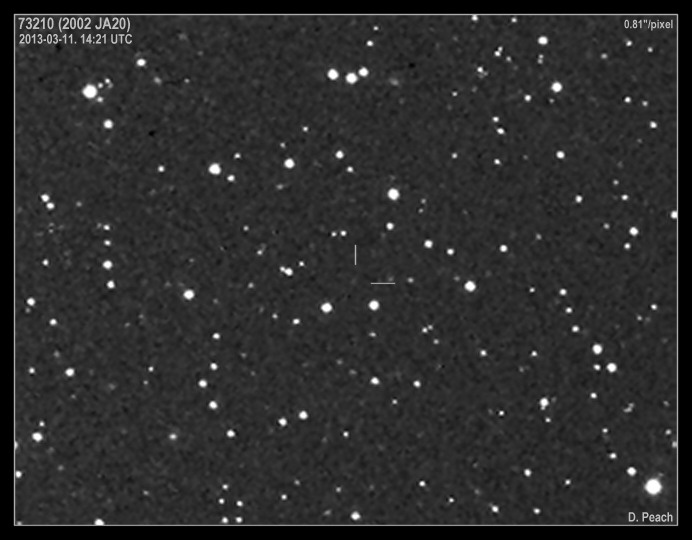 Asteroid 2002 JA20 20" CDK@F4.5. FLI-PL6303E camera. 4x3mins. March 11th, 2013. 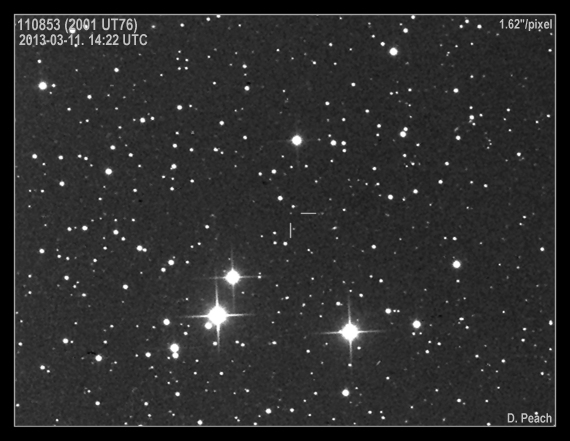 Asteroid 2001 UT76 20" CDK@F4.5. FLI-PL6303E camera. 4x3mins. March 11th, 2013. 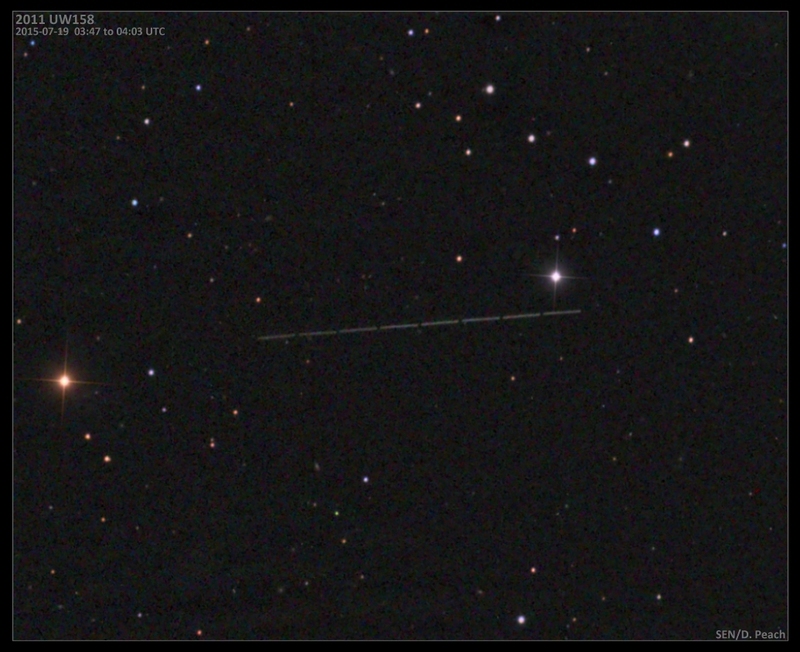 Asteroid 2001 AF16 20" CDK@F4.5. FLI-PL6303E camera. 4x3mins. March 11th, 2013. 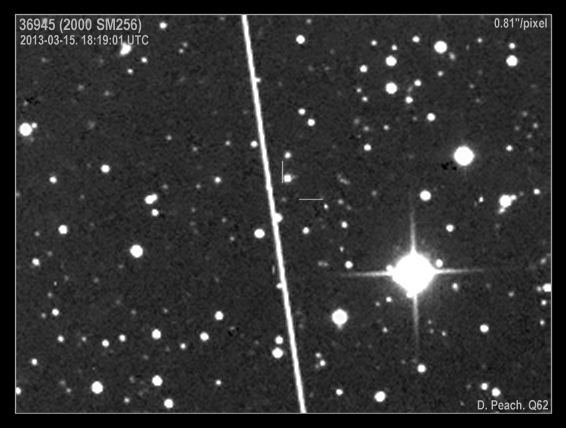 Asteroid 2000 SM256 20" CDK@F4.5. FLI-PL6303E camera. 4x3mins. March 15th, 2013. The bright line is a satellite trail. Asteroid 1999 VS183 20" CDK@F4.5. FLI-PL6303E camera. 4x3mins. March 15th, 2013. Very faint at magnitude 22. 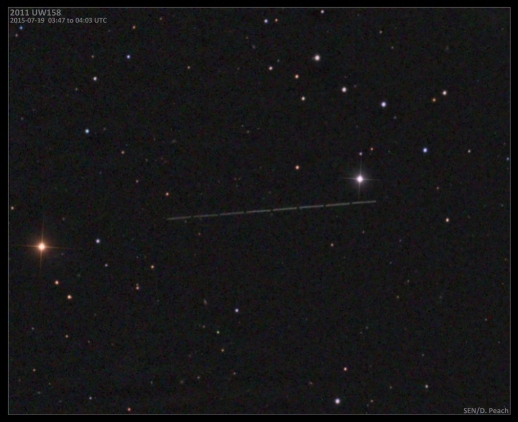 Asteroid 1999 GH59 20" CDK@F4.5. FLI-PL6303E camera. 4x3mins. March 11th, 2013. 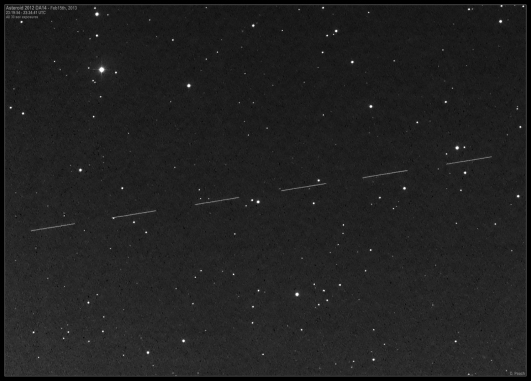 Asteroid 1993 OV5 20" CDK@F4.5. FLI-PL6303E camera. 4x3mins. March 11th, 2013.